Updated Dec. 12, 2017 at 8:02 p.m.
Hand crews digging a perimeter of containment around the 4,100-acre burn area of the Lilac Fire continued to make progress Tuesday in their efforts to make sure the once-roaring blaze cannot come to life again. The smoldering burn zone near Camp Pendleton in northern San Diego County was 95 percent contained as of early evening, up from 92 percent this morning, authorities said. 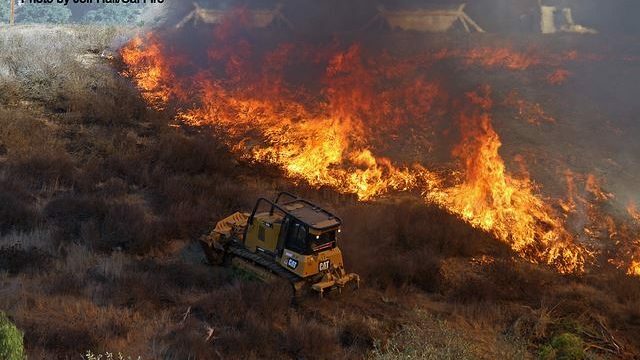 Officials expect to have the swaths of blackened terrain fully contained by Dec. 21, which would mark two weeks since the fire erupted for unknown reasons just west of Interstate 15 and north of Lilac Road in Pala Mesa, amid gusty, arid Santa Ana winds. Before authorities can declare a blaze fully contained, hand crews must dig down to bare soil around the burn area, ensuring there is no fuel if hot spots flare up. The Lilac Fire destroyed 157 structures and damaged 64 more, but no human deaths were reported. All roads that closed for the blaze reopened Sunday, and all evacuations were lifted over the weekend, though access to Rancho Monserate Country Club mobile home park in Fallbrook was still being limited Tuesday only to residents of the hard-hit neighborhood. Those who lived in that neighborhood accounted for the majority of the 107 households that sought services Monday at the county’s Local Assistance Center, a service set up after disasters to provide centralized assistance to disaster victims. County officials provided those seeking help with information about rebuilding and recovery as well as assistance to complete permit requests for temporary-occupancy trailers, temporary electrical service and other necessities, said Mandy Noza from San Diego County Planning and Development Services. One evacuation center at Palomar College in San Marcos remained open Tuesday, while the large animal shelter at the Del Mar Fairgrounds also remained open. The Lilac Fire, which broke out late Thursday morning, killed at least 46 horses, many of whom were stabled at the San Luis Rey Downs Training Center in Bonsall, while most others in the impacted areas were taken to Del Mar. A GoFundMe page benefiting the San Luis Rey Downs Training Center had raised more than $607,000 from 4,835 donors as of Tuesday morning. In total, 1,659 firefighters and other personnel helped battle the inferno. Cal Fire Battalion Chief Henry Herrera said that as many of the Cal Fire crews are released from the Lilac Fire they’ll be sent to Ventura County to help battle the Thomas Fire, which began spreading Dec. 4. It has scorched more than 234,000 acres, destroyed at least 790 structures and is still only 20 percent contained. Officials said the Thomas Fire is the fifth largest wildfire in state history, though the 2003 Cedar Fire in San Diego County still holds the record with 273,246 acres burned. 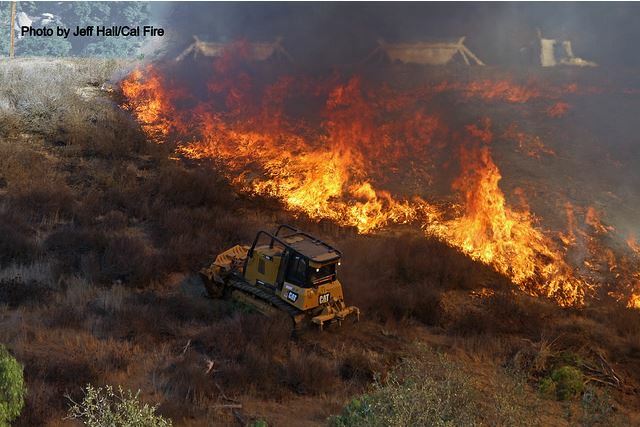 The 2007 Witch Fire and 1970 Laguna Fire, both in San Diego County, are also among the 10 largest in California history.